MELBOURNE'S finals hopes have taken a major hit with spearhead Jesse Hogan to miss the rest of the season. 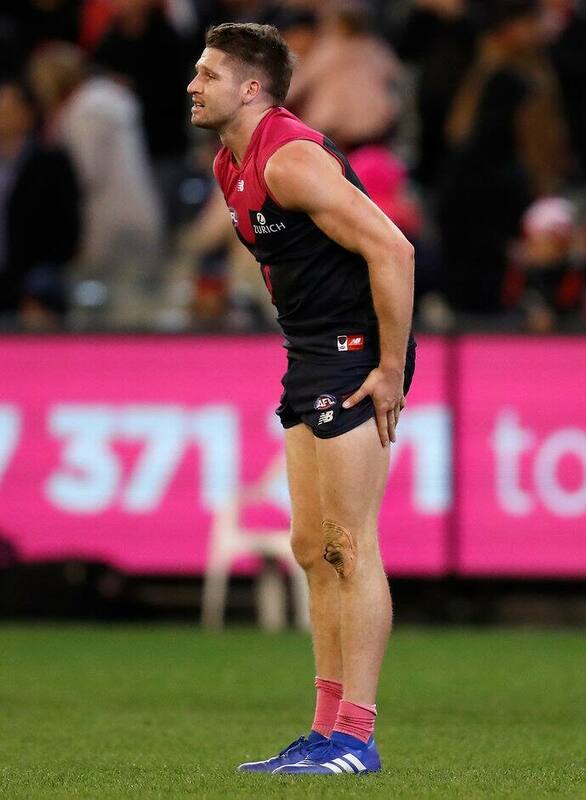 The Demons confirmed on Tuesday he had suffered a "partial stress fracture" in the navicular bone in his right foot during Sunday's loss to Sydney. Hogan revealed on Monday he had felt the soreness during the second term, which escalated during half-time, before returning to play out the match. "It's just a crack so it's not disastrous. We caught it pretty early," Hogan said on Tuesday. "The pain was hovering so it didn't crack all the way through thankfully so I won't require surgery or anything but it's enough to keep me out for the rest of the season." After multiple scans on Monday, Demons' elite performance manager Dave Misson told the club's website that Hogan's season was over. "He had an MRI scan and a CT scan and what it showed was a partial stress fracture to the navicular bone," Misson said. "What that means for Jesse is that essentially his season is over. It can develop into a serious injury and we feel we've got it quite early. "It's not going to require surgery and we're looking at a positive outcome for his preparation, going into 2019. "We think he's going to be right to go for the start of pre-season, but unfortunately for the rest of this season, that'll be it for Jesse." Hogan said the injury could have been far worse had the club not decided to end his season prematurely. "Initially when I saw the scans I thought it might have been 4-6 weeks," Hogan said. "It's obviously really disappointing but there's worse injuries. For example (Alex) Johnson did his ACL so I can't complain. "Footy's a pretty cruel game at times. I've had my own troubles and I think everyone does. "You can't have a perfect run, it's unfortunate obviously but you've just got to look at the positives and tick off the next box in your recovery." Melbourne's push for its first finals campaign in 12 years is delicately poised ahead of matches against top-eight teams West Coast and Greater Western Sydney. Still without a win against a top-eight team this season, the Demons must win one of their remaining two matches to control their own fate. Scans on Monday confirmed defender Jayden Hunt would miss two to four weeks with the ankle he re-injured against the Swans, his first AFL game since round seven. Veteran Bernie Vince's VFL shoulder injury that required surgery on Saturday night will rule him out for six weeks. Co-captain Jack Viney remains three weeks away with his latest toe setback, while Joel Smith (collarbone) could feature before the end of the home and away season. All Australian defender Michael Hibberd (quad) and Jake Melksham (hamstring) are in the frame to play the Eagles after training on Tuesday.